John Coltrane, Avant Garde Jazz, and the Evolution of My Favorite Things is a thesis by Scott Anderson which he has generously (and stylishly) put online. It traces the development of the Coltrane Quartet/Quintet’s handling of the tune “My Favorite Things.” Also a wonderful example of how a project-focused website should look. A link I discovered on the above site, which is also amazing, is to Improviz, a project by Jon Syndal to render visual representations of jazz improvisations. There are links to various PDFs containing Improviz content from this page. I’m probably the last person interested to have actually gotten around to these books, but I am currently reading Coltrane on Coltrane: The John Coltrane Interviews, edited by Chris de Vito, and recently finished reading Lewis Porter’s biography John Coltrane: His Life and Music. Both are excellent; though I have a few reservations about very small things in the Porter book (moments where I found Porter to be speculating a little beyond a reasonable doubt, or at least presenting his argument as if he felt he might be) the book was an amazing, beautiful read, exhaustively researched. Porter, quite astoundingly, attempts a list of all the documented gigs in Coltrane’s career. (Not just recording sessions, but actual shows too.) Since the only book I’d read about Coltrane was the Bill Cole book, back when I was an undergrad, this was a revelation to me. And as for Coltrane on Coltrane, it’s pretty wild to be reading so many interviews from throughout Coltrane’s career, as well as written correspondence and such. Here’s an interview with Porter about writing the book, and about Coltrane more generally. A pretty stunning surprise as to an apparent source for the head of John Coltrane’s Impressions. Yes, really. Listen here. The story is, finally, coming along. Of all things, it was listening to this interview by Karen Burnham with Terry Bisson and Connie Willis that pushed me in a much more, well, interesting direction with the story. 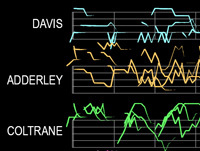 UPDATE: Oooh, one more: an interesting essay on the reception and idolization of Coltrane by musicians today, over at Savage Music, the same site that had the link about Impressions above. See Part 1 and Part 2. Despite my long comment, I think it’s an interesting and important topic.